Our caring dental professionals will work closely with you to reduce plaque and tartar. 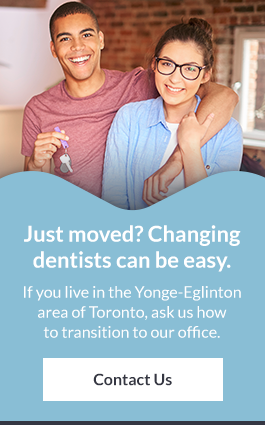 Capitol Dentistry at Yonge and Eglinton has an on-site periodontist that offers gum therapy services to help with early detection of Periodontitis, Gingivitis and other gum disease health issues that can cause sore gums. Gum disease – also known as Periodontal disease (Periodontitis) – damages the gums, ligaments and bone structure that support the teeth. It’s caused by the bacterial infection associated with plaque. Plaque is that clear sticky substance that builds throughout the day on your teeth which is removed by thorough brushing and flossing. Plaque that isn't cleaned off thoroughly hardens into tartar which must be removed by a dentist through 'scaling'. Tartar that is left on the teeth can cause inflammation that will irritate and damage healthy gums. Over time the bacterial plaque and buildup can result in the gums separating from their grip on your teeth causing 'pockets' between your gums and tooth to develop. These 'pockets' make room for more infection and additional problems to occur including receding gums and pain in gum tissue as well as loosened damaged teeth and constant breath issues and even tooth loss. Early detection for gum disease is the key. Periodontal disease is treatable and like most ailments, the earlier it is detected the more successful the outcome. The early stage of periodontal disease is known as Gingivitis. Gingivitis is extremely common and usually defined by mild to swollen gum irritation, minor bleeding gums during regular brushing and flossing and occasional bad breath caused by the gum infection. Gingivitis is caused by the bacteria from plaque under the gum line. Gingivitis is controllable and treatable with thorough home care and routine dental visits for a thorough cleaning and application of antibacterial therapies. Gingivitis left untreated can spread to the bone structure that supports your teeth. This is where periodontal disease sets in. As the infection progresses 'pockets' are formed between your tooth and gum, allowing tartar, bacterial and infection to accumulate and damage the underlying bone. As the Periodontitis advances the 'pockets' deepen allowing the infection to worsen and damage to increase. Is Gum Therapy covered by dental insurance? Your dental plan may cover periodontics. If you are unsure about what your plan covers, we recommend reaching out to your insurance provider for clarification. Do you think you might need treatment for gum disease? Book an appointment with our dentist or periodontist today.